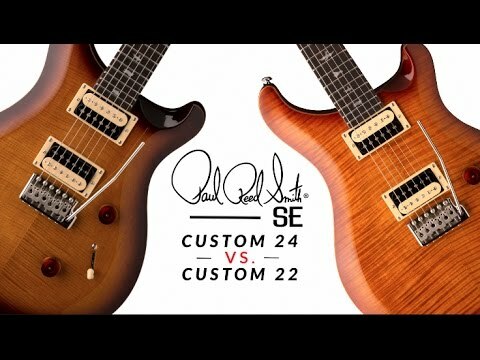 The SE Custom remains somewhat of an icon in the PRS line of guitars, and the 2017 SE Custom 22 is made to impress. PRS have taken inspiration from the more traditional, vintage features of their core models while adding some new and improved appointments for an all-round, well-built electric guitar. Whether you're used to a 22-fret axe or are looking for something a little bit more conventional, the 2017 SE Custom 22 is an excellent choice. PRS guitars are often easily recognised by their elegant double cutaway bodies, and this is also the profile of the 2017 SE Custom 22. Thanks to the double cutaway you have full access to all of the frets on the neck. The beveled maple top features a striking flame maple veneer which shines through the paintwork. Mahogany is used to construct the body back offering a beautiful tonewood partnership with the maple top. The 25 inch scale length 2017 SE Custom 22 is firmly joined by a maple neck for a smooth playing feel in the hand. The neck has a wide thin profile which is suited to faster players and lead guitarists. Topping the neck is a rosewood fingerboard which hosts 22 frets with the time-honoured bird inlays to guide you. The 2017 SE Custom 22 has been fitted with a pair of excellent humbucker pickups in the neck and bridge positions. Paul Reed Smith voiced the pickups to imitate the pickups found in core PRS models for an unparalleled tone. The updated 85/15 "S" pickups produce sweet highs that chime magnificently. The low and midrange notes are clear-cut, offering you a universe of tones to explore. The 85/15 "S" dual humbuckers are a coveted pair of pickups, especially as you can only get these when you purchase a core PRS model from the range. The controls have a simple setup but have everything you need to tweak Volume and Tone. There is also a 3-way toggle switch to alter between pickup combinations. The lower bout of the body is fitted with a PRS-designed tremolo bridge to perform excellent pitch bends. You need not worry about going out of tune as the PRS-designed tuners ensure total tuning accuracy. The headstock also features an updated logo with Paul Reed Smith's signature above the "SE". The nickel hardware adds a neat visual aesthetic to the flame maple veneer finish. The PRS 2017 SE Custom 22 is an electric guitar that fuses vintage inspiration in its sound and feel with the classic, meticulous PRS setup, so it's ready to play from the moment you take it out of the box.